An animal like this you would rather not meet when walking alone through the forest. With its legs braced and leaning backwards, its snout open (probably a snarl coming out of it), it stands ready to pounce on you. The canvas is large, the background restless. The beast is black, standing lonely in the dirty snow, so it seems. Above its head and in front of its mouth there is dark smoke. I can discern neither ears nor tail. Is it a female protecting her nest? And yet, the longer you look, the less frightening this animal appears. Its eye stares out at us somewhat disconcertedly. There are no bared teeth. There is fear that can turn into aggression at any moment. The poor animal does not become endearing, however, as it is too big for that to happen. Armando (b. 1929), the Dutch artist who made this painting, is not optimistic about human nature. As an eleven-year-old he saw how a German soldier mistreated a Dutch person in the woods near Amersfoort. Since that time he is driven in his visual and literary work by the motto ‘Man is a wolf to man.’ WW II is the main source of his work. You will, however, never see concrete historical situations depicted in his paintings or bronze sculptures, nor specific geographical locations. Yet everything refers to the war. An animal like this one, frightened and vulnerable and therefore also aggressive and dangerous, appears more than once in his work, each time with the general designation ‘Das Tier’. Other motifs are, for instance, ‘Gestalt’ (human forms, often in carbonized black, dark green or blue, with helplessly outstretched arms), ‘Kopf’ (human skulls with opened mouths), and ‘Denkmal’ (massive memorial forms). Armando has a message to bring. Counter to the long prevailing trend of ‘l’art pour l’art’, an art existing only for itself - having nothing else to communicate than that art is autonomous, he keeps to his maxim: man is not good, even if we would like him to be. Cain killing his brother Abel, that is the primal human state. Yet Armando is not a moral crusader. He is not only talking about others, he is also talking about himself. He does not want to change humanity; comprehension of the reality of the human condition is the most that can be achieved. Why all these German titles? In 1979 Armando moved to West-Berlin to be surrounded, as it were, by the evil that is also present in himself. In every older German person he saw a perpetrator, just as he himself in principle is one. The German titles came about with this kind of identification in mind. Recently I spoke to a church group about the work of this artist, unknown to most of the people present. Someone asked if he was ever happy. It seems to me that the answer cannot be simply ‘yes’. Still you notice in his creative work that he converts fear and aggression time and again into art. In this way he wards off evil and transforms it into beauty. ‘The beauty of evil,’ he calls it. It is beautiful in a haunting way;you can look at it for a long time. 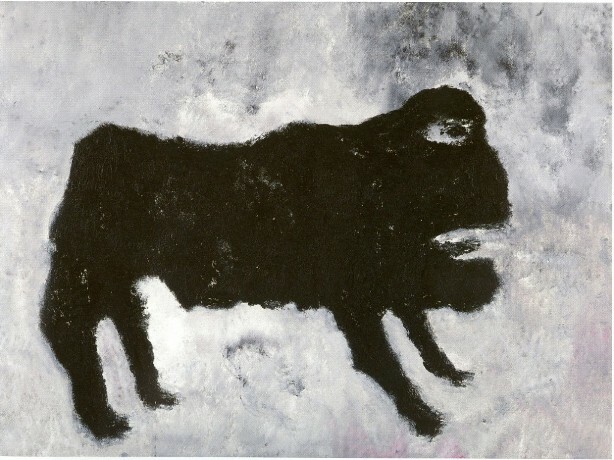 Armando, Das Tier, 2005, 150 x 200 cm, courtesy Galerie Willy Schoots, Eindhoven. Dr. Anne Marijke Spijkerboer writes about art and theology (Wij hebben ongelofelijke dingen gezien, Meinema 2004; Rembrandts engel, Skandalon 2006) and is a pastor in Rijswijk ZH, The Netherlands.